Vernie Edward “Cotton” Ketchum, age 78, of El Dorado Springs, MO, passed away unexpectedly at his home on Wednesday evening, December 19, 2012. Cotton was born January 12, 1934, in Lowry City, MO, the son of Vernie Elvin and Leona May Ketchum. Cotton attended school in Collins, MO. On August 2, 1952 he married Mary Francis Jennings. They were married 44 years before Mary’s passing in 1996. To their union one child, Vernie Ketchum, was born. Mary and Cotton lived their entire married lives in El Dorado Springs. Cotton enjoyed his life with his family and friends. He was a very hard worker and wonderful husband, father and grandpa. The two most important things in his life were his grandkids, Courtney and Corey. In his younger days Cotton had many jobs, starting when was 13 years old in the Kansas wheat harvest driving a truck with his brother. He also worked in the Colorado mountains with a logging company that crafted wood stave barrels. He worked many other jobs before choosing a career in heavy machinery operation. He started with D.O.W. Construction doing many jobs on farms in the area and eventually was involved with the construction and development of Stockton Lake. After its completion, Cotton went to work for Menefee Construction building many turnpikes and roads throughout the Midwest. Cotton could run any piece of machinery, but was an expert dozer operator until his retirement on May 24, 1996. Cotton had many hobbies and interests. 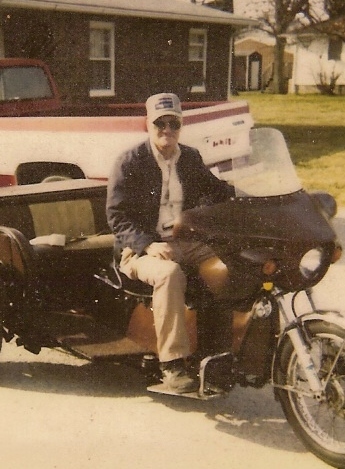 Starting in his teens he had a passion for riding and tinkering on motorcycles. When holding up a motorcycle became difficult he started building 3 wheelers so he could continue his passion to ride. When going on a motorcycle ride there was no need to take a GPS as Cotton knew every road on the map and some that were not. Cotton loved to build and fabricate things. He always had to be working on something. Fishing was also a great joy to Cotton. He couldn’t wait for Corey to be on springbreak so they could go to their “secret” spot. Cotton loved to go and watch all of Corey’s sporting events, and he never missed a single one. He knew and loved every teammate Corey had throughout that time. He was never shy about making friends anywhere he went. Cotton took great pride in his yard, sometimes mowing it several times a week. He was always finding joy in keeping up with all his family and friends. He really enjoyed his daily visits with friends at the coffee shop. Preceding Cotton in death were: his wife Mary Francis; his parents; and one brother. Survivors include: his son Vernie of El Dorado Springs; two grandchildren: Courtney of Thornton, Colorado and Corey of El Dorado Springs; and special companion Murrell Copenhaver of El Dorado Springs. Cotton will be truly missed by his family and friends. Services for Cotton Ketchum were held on Sunday, December 23, 2012, at 2:00 p.m. at Bland-Hackleman Funeral Home with Rev. Brent Bland officiating. Burial followed in El Dorado Springs City Cemetery under the direction of Bland-Hackleman Funeral Home. Pallbearers were: Corey Ketchum, Logan Schwalm, Jerry Miles, Neal Jennings, Jeff Janes, and Eric McPeak.